and now kicks off a week of pet posts - because sunday was hawkeye's 5th birthday and we celebrated in kind. don't worry, of course we'll tell you all about it. hawkeye loves to be the star of the show after all. but first, pet gifts. because it all started with 'what do you get the dog who has everything including her own water bed?' when the toys are boring and she already has all the treats, what do you do? turn to the outrageous of course. so yes, these pet gifts really are available for purchase. don't think i didn't seriously consider them. 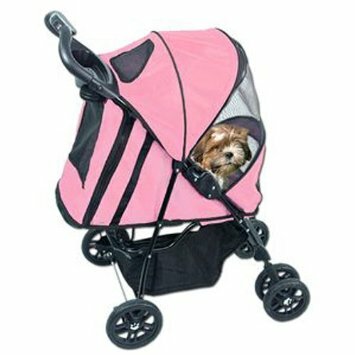 hawkeye's top pick - a dog stroller. she gets two blocks and jumps up so i'll carry her the rest of the way. she wants a stroller really bad, but i told her walking works off all that taco bell. if i pushed her everywhere, she'd need a doggie treadmill. hrh princess hawkeye would not be pleased. technically, there's no furniture hawkeye hasn't been on. but must my whole apartment go to the dogs? she thinks so, she'd like these end tables. but we can both agree on petchatz. 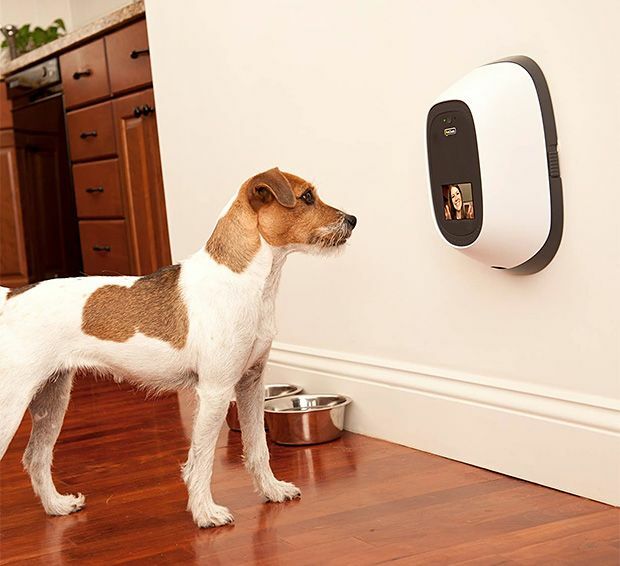 it's a video camera that goes on the wall so you can see you pet and talk to them while you're away. it can also dispense treats. don't worry, i'm on the waiting list. which one would you pick?! You would get the last one haha. I love that it can dispense treats though that's awesome. omg. this post! I love it. 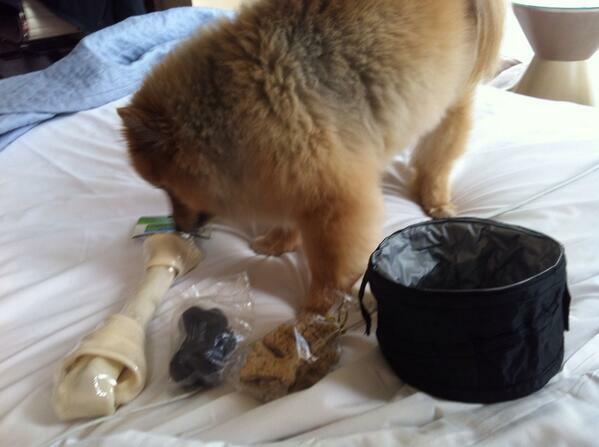 My pets are my everything and these are some outrageously awesome pet presents!!! I need to check in on my dog. I need that!!! Seriously I'd probably not get anything done while I was gone because I hate when my dog is alone. Seamus needs the treadmill but I need the petchatz!! I was at the outlet mall this weekend and thought a lady and her baby were blocking my way with the mirror but no, it was a lady with her dog in a stroller just hanging out at J. Crew, no big deal. That camera is pretty cool, though. When we had an answering machine, I would call it to talk to the cat while I was gone... no shame. I love the last one, and the end table...but as my boys get older the stroller looks good too! OMG these are the best. I would totally get the end tables, my little guy would like those! My friend has the stroller for her dog. Westley was very jealous. I actually REALLY want the end table and the video camera. My sister babysat Westley a couple of weeks ago, while I went away for the weekend and she was annoyed I made her put him on the phone. I love the tables. My dog would love those. Hawkeye would love to hide her things in them, I'm sure!! Oh my God. I want all of these! Jessie could totally use the doggie treadmill, too! i am laughing out loud. like actual laughter is coming out of my mouth right now. The end table is perfect! Multifunctional and (only a little bit) cute, haha. Pippa would still insist to be right next to me on the couch though. Oh......my...... not going to lie I kinda want that petchatz and I'd put it at Marks work then I could really drive him crazy! I'd take the pet camera, I always wonder what my dog does when I leave the house. I love the petchat. My husband and I often wonder what Walter does when we are gone. Obsessed, yes I know. This would be the best most awesome gift. Hawkeye has a waterbed? Oh Walter is all jealous right now. I love the pet camera! I have a feeling though that Jamo just lays in our bed and naps while we're gone. I really like the end table doggy beds. Although I'm pretty sure the cats would take it over because I've already caught one in the little box in our end table and it's tiny! Ahhhhhh Petchatz!! I need that yesterday. I mean, who wouldn't want to talk to their dogs all day. I am pretty sure I would get nothing done at work though. They always have doggy strollers on sale at Bargain Hunt and I always threaten my husband that we need one for Mac. He might think I am joking...but I am not! 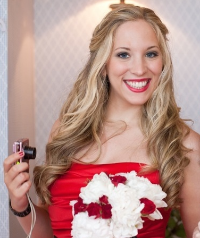 I'm on a list for a pet cam/treat dispenser thingie too! 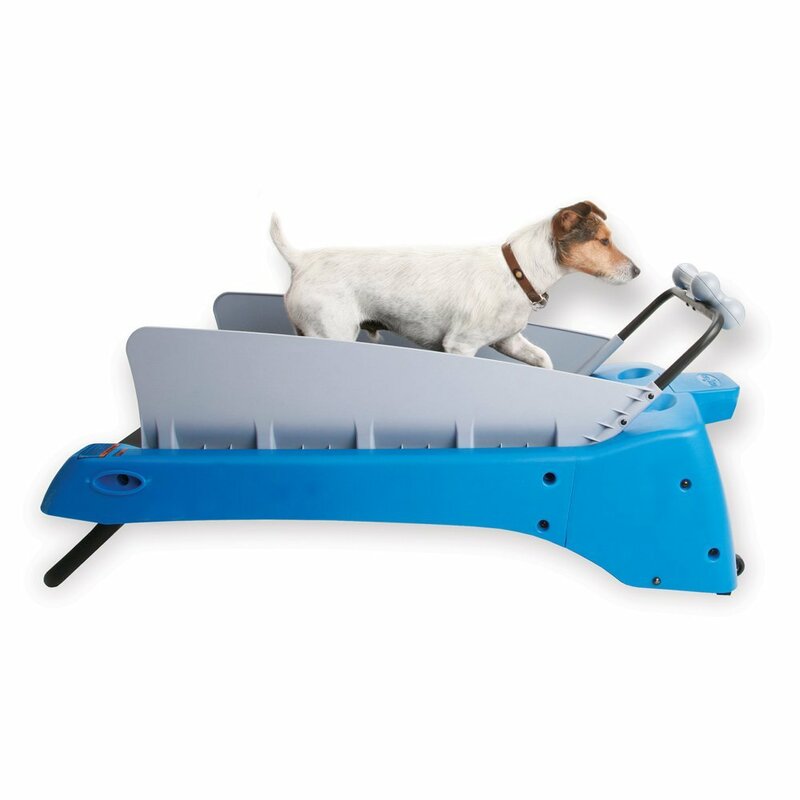 And I really want a doggie treadmill but they're so dang expensive! I NEED that pet cam! I keep saying that I would be much more at ease if I could just check in on Cooper throughout the day. Greatest idea ever! I don't understand the treadmill, just take them for a walk. but the camera thing is pretty cool, if I still had a dog I'd highly consider buying that. I need to get a dog. I actually really like that end table, so I may go with that. But I would LOOOVE to push my Linky Cat around in a stroller on a beautiful day! I love love the petchatz - I first saw that awhile back and I was oh my goodness, that is actually really cute!! These are cute and hilarious! The petchatz sounds awesome! And that treadmill is so cool! I don't even have a pet and I want a petchat! 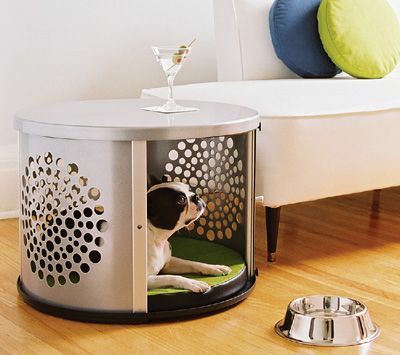 The end table slash dog bed is ingenious. Plus, my dog gets first dibs on crumbs, so it's a win win. I still don't understand why you DON'T have any of these things...poor neglected Hawkeye! hahaha a treat dispenser video transmitter!? PURE genius. Hawkeye is adorable! I don't have a dog anymore just kitties but I bet they would love the end tables. I would love the camera to see my kitties when I'm away. the Petchatz is crazy cool!! I love the last one, but i don't think I would do anything at work. I would constantly be checking up on him. Haha yeah, I'd definitely just be talking to Hawkeye all day! i would totally do the pet chatz one!! but he would probably get mad that i was waking him up from his nap! !